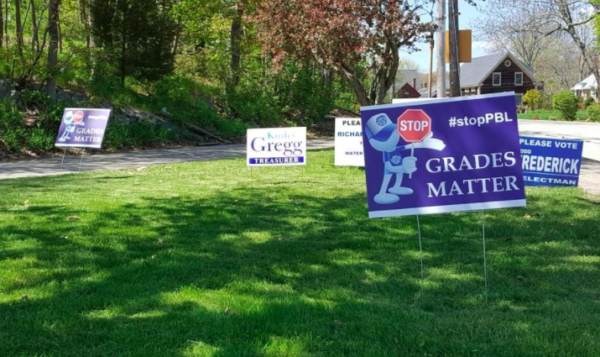 Along with the seasonal campaign signs in York are signs posted by parents decrying a new proficiency-based grading system. The backlash against a statewide move to proficiency-based high school diplomas is manifesting itself in school board elections this spring. It follows a season during which the backlash was felt in the state Legislature in the form of a bill to remove the mandate that schools award proficiency-based diplomas. The legislation was gaining bipartisan traction before the Legislature’s premature adjournment. Earlier this month, voters in York ousted a school board incumbent who had professed his support for the move toward proficiency-based learning in the town’s schools. They replaced him with a proficiency-based learning skeptic. Voters in Scarborough recalled three school board incumbents for a variety of reasons, including their support for the district’s adoption of proficiency-based education. Proficiency-based diplomas are going the way of so many educational initiatives in Maine’s past — toward abandonment, after years of effort invested by teachers and administrators as well as state education officials, in favor of the next new education policy push from state education officials. For the past six years, that push has been in favor of proficiency-based diplomas. It fit neatly in Maine’s trajectory over decades toward an educational system grounded in students’ achievement of clear, specific academic expectations before graduation. Originally, students graduating in 2017 were to receive high school diplomas only once they demonstrated mastery of the state’s academic standards, as opposed to earning credits based on completing a year of coursework. Lawmakers previously pushed that date back to the 2020-21 school year, and the requirement that year will apply only to four of the state’s eight subject areas: math, English, science and social studies. A bill that’s still pending in the Legislature would make the proficiency-based diploma requirement optional for schools. That bill garnered a 10-3 vote in the Education Committee, indicating a high degree of bipartisan support for the move. If proficiency-based diplomas become optional, they’ll go the way of local assessments, school district consolidation, the Smarter Balanced Assessment Consortium — all initiatives into which educators and school officials invested substantial energy before the state abandoned them — many teachers and administrators likely won’t be surprised. And the optional nature would allow inequalities in educational opportunity to persist from district to district. In many cases, the crux of objections to proficiency-based diplomas is the abandonment of the A-F grading system in favor of a system that uses numbers to detail students’ performance and whether they’ve met the appropriate expectations for each class. Though fraught with implementation challenges, growing pains and controversy, it’s still worth working toward proficiency-based diplomas. The path there, however, doesn’t have to look like a numbered grading system and a proficiency-based learning style in which students work at their own pace, completing projects in order to master academic expectations. Those elements of proficiency-based education have become unnecessarily wrapped up in the implementation of proficiency-based diplomas. As Lynne Miller, an emerita professor of educational leadership at the University of Southern Maine, pointed out in March in a BDN OpEd, there’s no legal requirement that schools use either the educational style or numbered grading system. “Schools are free to adopt proficiency-based education but they don’t have to,” she wrote. “There are other options. Teachers already use a variety of strategies, not just one, to reach their students. “Similarly, school districts already use a variety of methods to assess proficiency; they can choose from among them for certification,” she continued. Proficiency-based diplomas are still worth fighting for because Maine should be striving toward an educational system in which all students graduate from high school equipped with the knowledge and critical thinking skills they need to succeed in college and in the workplace. The path to that diploma, though, doesn’t have to look the same in every school. How did Sarah Huckabee Sanders say that with a straight face?